Experience is everything. And the payoffs are valuable. Travelsify, a content analytics platform, has found a disconnect between the way guests describe a hotel and how hotels describe themselves. According to Gallup, a comfortable bed is most requested by hotel guests in all levels, and guests are willing to pay extra for an enhanced bed experience. In a TripAdvisor survey asking if visitors take sleep quality into consideration when choosing a hotel, 55 percent of respondents said they look for online hotel reviews that address sleep quality. The Booking.com Guest Review Awards have uncovered that the number one requisite of tourists has always been a comfortable bed for them to sleep peacefully. Out of the 17,000 respondents, 80 percent said a comfy bed would make them happy. More than 9 in 10 global adults say sleep is crucial to their overall health and wellbeing. Yet it remains frustratingly elusive for many of us, especially while traveling. Whether you are a jet-lagged road warrior looking for a restful night before a sales meeting or you just got off a seven-hour long haul to kick start the yearly family vacation, who wouldn’t want to have the perfect night’s sleep? If you’re in “the business of sleep”, what’s more beautiful than embracing the subject of sleep, making that part of the brand personality, a mantra permeating in the whole customer journey? The challenge is in the customer journey, in communicating a restful and rejuvenating night’s sleep as an essential part of the guest experience. This is where brand personality and guest experience should match, during the whole journey. Europe’s most modern health resort Lanserhof is probably the most beautiful example of doing this. Knowing that sleep is the foundation for our wellbeing they already started long ago with the topic of sleep. Long and far at the top of their game, nothing has not stopped this winner of the World’s Best Medical Spa Award 2018 from continuing to up the ante, and proof of that is their most recent concept: LANS Better Sleep Programme 2.0 with Better Sleep Suites. Equipped with FreshBed taking over the task of care about the well-being of their guests as they go to sleep – making their stay a 360 degree, 24/7 wellness experience. Sleep is consistently being used in every communication touchpoint in their customer journey. Recently they paid attention to the “clean sleeping” trend in their newsletter. Lanserhof concerns a leading medical spa focused on primary wellness travelers, who are motivated by wellness to take a trip or choose their destination based on its wellness offerings. But the bulk of wellness tourism is done by secondary wellness travelers, who account for 89% of wellness tourism trips and 86% of expenditures in 2017. Secondary wellness travelers seek to maintain wellness or engage in wellness activities during any kind of travel. As sleep quality has grown in the public consciousness as a key measure of health, creativity and productivity and as more consumers incorporate wellness into their lifestyles, there are many opportunities for hotels to infuse sleep into their offerings and the customer journey, which can help them differentiate, provide more value, and capture higher spending by wellness travelers. When it comes to a hotel’s ability to woo new guests and wow them to the point that they simply must return (and tell their friends), sleep is an opportunity sweet spot for the hotel industry in closing the gap between brand personality and guest experience. 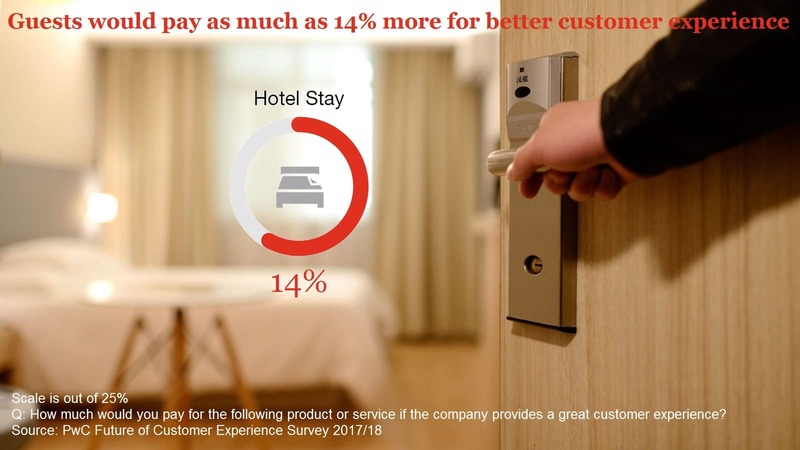 PwC’s Future of Customer Experience 2017/18 Survey shows the payoffs for valued, great experiences are tangible: up to a 14% price premium on a good customer experience for a hotel stay, plus increased loyalty. We’re happy to help you in achieving this. Our FreshBed is scientifically proven to deliver up to 50% better sleep. Our pillow with built-in Zeez Sleep Pebble technology improves sleep by reducing the impact of stress and can also help long haul passengers overcome jet lag. With more than 25 years’ experience in the field of sleep, we have an extensive network of specialists and suppliers who can help you with everything you could wish for in creating the conditions that make that elusive experience possible: the perfect night’s sleep.